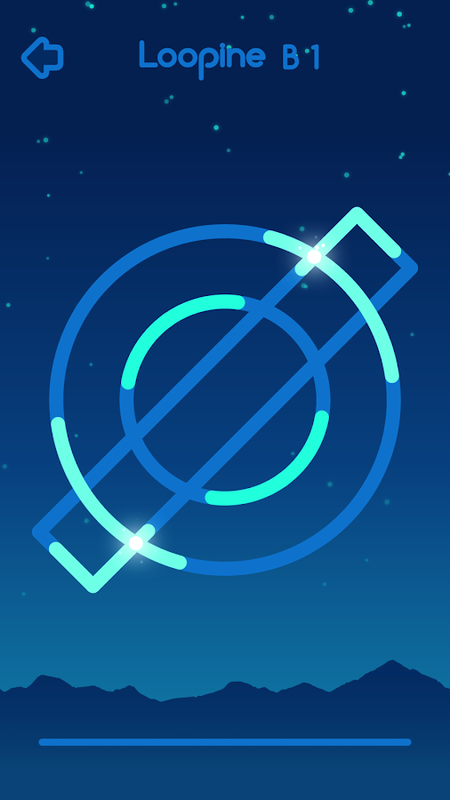 Loopine is a new puzzle game with moving lines and loops that needto be synced to avoid collisions. Play with elegant patterns andinteresting shapes in the 150 levels of Loopine. Lazors is a puzzle game of lasers and mirrors offering more than ahundred levels, ranging from easy distractions to hard challenges.+280 levels+ Intuitive gameplay+ Hint systemMove blocks, reflect thelaser, hit all targets! The Weaver is a new type of puzzle game! Use logic to fold thelines and match colors with a simple and stylish interface over 150levels. Chess Light is a puzzle game inspired by chess for everyone: fromBeginner to Grandmaster.+ 180 puzzles+ 6 difficulty levels+ HintsystemPlace the pieces on the board and light up all the squares! A Year of Riddles gives you hundreds of classic riddles to solve. +365 riddles - all accessible from the start + Intuitive interface -tap or drag letters to write the solution + Hint system based onpoints + Clean and minimalist design This game has one riddle foreach day of the year. All of them are accessible right away, foryou to play at your own rhythm. Write the solution from the 15letters available. As soon as the correct solution is entered, theriddle is solved. If you get stuck, the hint system will help you.Get the first letter of the solution (1 point); the last letter (2points); the number of letters (3 points); and after these thesolution (4 points). You start with 40 points, get 2 more for everyriddle solved, and you can also purchase more points. Solve everyriddle in A Year of Riddles! Spot the differences in classical paintings with Broken Brush!+ 65paintings+ 25 extra paintings obtainable with ‘Unlock All’+ Over athousand differences+ HD graphics+ Intuitive gameplay+ HintsystemFind the mismatching elements between two images: the one onthe left is the original painting while the one on the right hasminor variations.The interface is easy to use and lets you explorehigh definition images of classical paintings: pinch to zoom, dragto pan the image, and tap to mark the differences.You can use hintsto help you narrow down and find the harder differences. Solve apainting to earn more hints. Daily Crosswords is a game with hundreds of new and originalcrossword puzzles! Over a thousand crosswords are accessible rightaway to be played at your own rhythm. When stuck you can use hintsto reveal letters. Earn extra hints by playing every day. EnjoyDaily Crosswords! Another Year of Riddles is the sequel to A Year of Riddles, withhundreds of brand new classic riddles to solve! + 366 riddles -even more than before! + Intuitive interface - tap or drag lettersto write the solution + Hint system based on points + Clean andminimalist design This game has one riddle for each day of the year- even if it's a leap year! All of them are accessible right away,for you to play at your own rhythm. Write the solution from the 15letters available. As soon as the correct solution is entered, theriddle is solved. If you get stuck, the hint system will help you.Get the first letter of the solution (1 point); the last letter (2points); the number of letters (3 points); and after these thesolution (4 points). You start with 40 points, get 2 more for everyriddle solved, and you can also purchase more points. Solve everyriddle in Another Year of Riddles! Make Hexa Puzzle is a simple yet addictive gameplay that challengesyour brain. Simply drag the same-colored triangles to make multipleHexagons! Discover the most unique mobile game of the year and findyour new addiction right now! Make Hexa Puzzle is a very fun andexciting block match puzzle game, it makes you keep playing! TheKING of BRAIN TEASERS! Do you enjoy the puzzle games? Do you likelovely colors? Here comes the perfect game for you, Make Hexa!FEATURES • BLOCK MATCH PUZZLE - Ideal for all ages - Play easilyand quickly. • EASY AND FUN PLAY - Easy to learn and fun to mastergameplay • NO TIME LIMIT - Enjoy game for any time, anywhere and ashort time. • NO WIFI? NO PROBLEM! - You can play offline inanytime. • INSTANT SAVE! - Always save the game when you quit orturn off your phone. • STUNNING GRAPHICS - Soothing sounds andgorgeous visual effects. NOTES • Make Hexa Puzzle contain ads likebanner, interstitial, video and house ads. • Make Hexa Puzzle isfree to play, but you can purchase In-app items like AD FREE andCoins SUPPORT UNIVERSAL APP • Enjoy the game with various devices. (Phones and Tablets) E-MAIL • [email protected] HOMEPAGE •https://play.google.com/store/apps/dev?id=6249013288401661340 Likeus on FACEBOOK • https://www.facebook.com/BitMangoGames Thanks forplaying! It's a cute puzzle game.Just paint all the squares :)Easy to learnbut hard to master, will you take the challenge? Sequel to #1 puzzle game, KAMIThe calming, addictive puzzle game isback!With over 100 hand-crafted puzzles, and with over one millionplayer created puzzles created worldwide, Kami 2 takes you on amind-twisting journey that combines logic and problem-solving.Canyou achieve perfection?Flood each puzzle with a single color in asfew moves as possible to claim a 'Perfect' sticker. But watch outfor subtle new tricks and fiendish surprises.Want even more?Beatthe global Daily Challenge, earn a winning streak and compare yourscores to other players. Test yourself on thousands ofuser-generated puzzles, uploaded daily.Get creative and take on theworld.Craft your own KAMI designs using the Puzzle Builder. Designand share your creations, send them to your friends and challengethe world to beat your score. Yellow, a puzzle game for you! Can you make the screen yellow inall 50 levels? Each level has its own logic. A Bart Bonte /bontegames puzzle game. *** Free to Play ! *** Coloring Puzzle is a free-to-play puzzlegame according to Four color theorem! *** Simple Rules ! ***Coloring the piece of puzzle anywhere you want! Set differentscolor side by side. You can check it correct or not by using thehint function! *** Lots of Illustration ! *** Bears, Sumurai,Rabbit, Astronaut and etc. We hava many variation of the puzzleillustation! *** New illustration is adding on time ! *** We arewaiting for your idea to make a new illustration ! Do you feeltried now ? Let's take a break to play Coloring Puzzle! Enjoy tosolve the puzzle by only set differents color side by side. We hopeyou can breath and prevented stress by playing our Coloring Puzzle.